Mushrooms are fungi used in recipes, beverages and medicinal preparations. This fungi often grows in clusters on wood and the forest floor. Certain clusters of mushrooms indicate fungal diseases in nearby trees, and some are considered edible delicacies. However, all mushrooms are not edible and can produce symptoms of poisoning. Proper identification is important when using wild mushrooms for food. Trees infected with Armillaria mellea root rot disease, often develop clusters of mushrooms. These are known as honey mushrooms, named for their honey-colored caps. 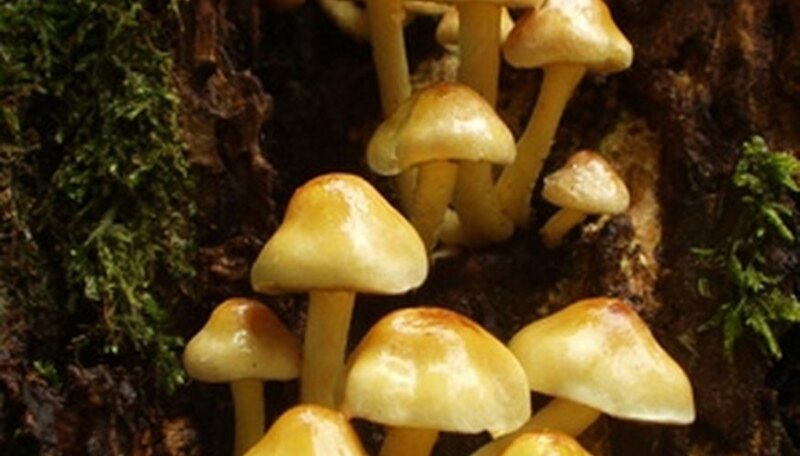 Honey mushrooms are short-lived and develop around infected tree stumps or at the bottom of the tree. These mushrooms usually appear during periods of wet weather during the late summer and early fall months. Honey mushrooms have two-inch stalks, yellow or honey color caps and are two to five inches wide. Artist's conk is known by the scientific name of Ganoderma applanatum and are commonly found growing in clusters on hardwood trees, such as the maple tree. The top of this mushroom is hard and ranges from two to 26 inches in length. Artist's conks are shelf-shaped or resemble the shape of a horse's hoof. This fungi is usually gray, black or brown in color, with a white surface underneath the cap of the mushroom. Turkey tail mushrooms often grow in clusters or rosettes on decaying wood. As the name suggests, these mushrooms resemble a turkey's tail and have a velvety soft cap surface. Turkey tail mushrooms are approximately 3/8 to 2 inches in width, fan shape and come in a wide variety of colors such as orange, gray, green, brown and blue. The Shiitake mushroom grows in clusters on hardwood trees such as maple. Laurel oak, cherry or hickory. Native to Asia, the Shiitake mushroom is also known as the Japanese mushroom, golden oak mushroom and the Black Forest mushroom. Shiitake mushrooms are often used in recipes and have a high vitamin content. For this reason, many people grow Shiitake mushrooms at home on logs or sawdust blocks. Shiitake mushrooms have approximately two-inch stalks and gray to black caps.